The University of Arizona mall was packed with students yesterday. 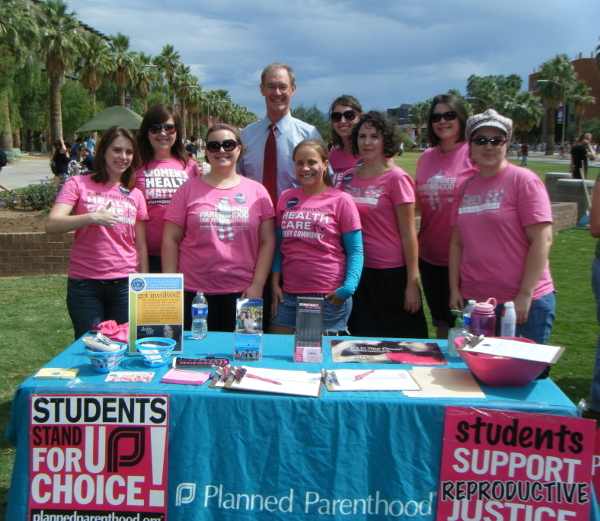 Terry Goddard was the keynote speaker at a rally organized by several student organizations, included VOX: Voices for Planned Parenthood. Other Democratic candidates for office, such as Rodney Glassman, Chris Deschene, and Penny Kotterman, also spoke to the enthusiastic crowd. And as usual, Planned Parenthood volunteers showed up in droves at the event to show their support for the PPAA-endorsed candidates. Terry Goddard emphasized that if he is elected governor, his top priority will be education, because education is the key to Arizona’s economic recovery and its ability to compete in a world market. He closed his remarks by urging people to get involved by committing to tell ten people about what the election means to them. Goddard’s remarks were echoed by the other speakers. Rodney Glassman, who is running for the US Senate against John McCain, said that education and job creation should be the top two issues in this election. Chris Deschene, who is running for Secretary of State, argued that Arizona’s leaders needed to set political differences aside to help move the state forward, and that his vision of leadership includes everyday people getting involved to help change the state. Penny Kotterman, who is running for State Superintendent of Public Education, said that it’s time to put a teacher in charge of running the state’s education system, and she asked the audience members to talk to their family and friends about the importance of this election. This entry was posted in Elections and tagged Arizona, Chris Deschene, Democrats, election, Penny Kotterman, Planned Parenthood, pro-choice, Rodney Glassman, Terry Goddard by Serena Freewomyn. Bookmark the permalink.